Storm King Installation Time Lapse from Gabriella Marks Photography. FOR 40 YEARS, the Governor’s Awards for Excellence in the Arts have singled out artists and their supporters for an annual round of applause. (You’d think our palms would be getting sore by now.) In 1974, Georgia O’Keeffe, John Gaw Meem, and Maria Martinez were honored for their contributions of iconic New Mexican style. Then there was the year Tony Hillerman shared the stage with minimalist sculptor Larry Bell, in 1990. In a state not hurting for talent, the procession of awardees has been as steady as it has been spectacular. This year’s crop is no exception. In the September issue, we profiled the straw appliqué artist Jean Anaya Moya, the cowboy artist Robert “Shoofly” Shufelt, and Dr. Dave Warren, a Pueblo scholar and arts advocate (mynm.us/artscp914). This month, we look at another group of artists and community leaders (frequently both) who are changing the way people see, hear, and think about New Mexico. Go ahead, give them a hand. Don Redman dreams of fettuccine. Not eating it. Not cooking it for his daughters, although he suspects that’s where this idea got started. Asleep, he dreams of sculpting with it, of soldering stiff planks of pasta into some new object with an energy all its own. 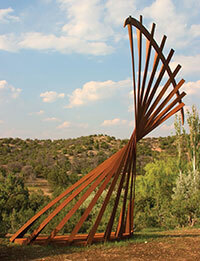 Steel is what he’s been working in lately—most recently Corten, the weathered alloy favored by Richard Serra. Redman likes the way its patina of rust protects it from the elements, and how its color complements the aquamarine of safety glass. He likes that it will last 500 years. Durability matters, not just for Redman’s legacy, but because his objects are so often exposed. They play with desert sunlight, interact with thunderstorms. Once, in the Navajo Nation, he erected a kinetic sculpture called Storm King whose blades, whirling in the wind, powered floodlights on a hill above the highway. People called 911 because they thought it was a UFO. State troopers showed up with shotguns. Redman laughs when he tells the story. That piece, too, was steel—stainless and gleaming. Wood came earlier, back in Houston. At age 10, Redman got his first commission: $20 to draw a couple of pegasi on plywood for a filling station. “Jeez,” he thought, “they’re going to pay me for something I love to do anyway?” But it didn’t always pay. He remembers tearing down old houses just to create things from the beams. He was that eager to learn. Out of high school, he apprenticed with Luis Jiménez, who let Redman use his shop at night, and later Salvatore Scarpitta. He worked as a carpenter and a shipbuilder, learning to make the kind of big, powerful objects that would hold people’s attention. For a while he lived on $50 a month. Redman came to New Mexico the way a lot of artists do. A commission led to a residency, which led to a life. But what’s held him here is hard to define. Santa Fe inspires creativity, he says, “just because of the light.” He likes to get outdoors, out past “man’s laws” and into nature’s jurisdiction. That can mean fly-fishing naked on a sandbar in the Río Grande or peering down on a family of otters from a 100-foot cliff. Anything to get away from the world of galleries and museums, where he doesn’t feel wholly accepted and finds little that excites him. Receiving a Governor’s Award along with George R. R. Martin feels good. It even feels a little like acceptance. Still, there are bills to pay, restless ambition to feed. And so he’s back in his studio, noticing the shadows cast by bits of scrap metal, working in any medium—“it could be sand, it could be zucchini, it could be whatever”—that might help him find his next step. Could even be pasta. One can dream, anyway. The first artwork that Kent Jacobs ever collected was given to him by José Rey Toledo in the Pueblos of northern New Mexico, where Jacobs worked after finishing medical school. The second was a going-away gift from the Laguna Pueblo tribal council. “When I got back to Las Cruces, I happened to go to this artist’s studio by the name of Sallie Ritter, and I purchased one of her paintings. So that was the third,” he says. That blend of sociability and refined sensibility has served the couple well over their years of collecting, supporting, and creating art from their home in the Mesilla Valley. Now they’re planning to make the home itself a gift. 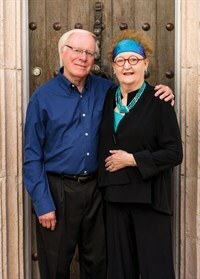 In 2009, Jacobs and Ritter announced their intention to bequeath their 8,000-square-foot property and extensive art holdings to the Museum of New Mexico Foundation for the creation of a new museum. Exhibitions will be in good company there. The Jacobs-Ritter Compound houses an impressive roster of artists from the Southwest (2010 Governor’s Award recipient Woody Gwyn is a favorite) and Mexico (including David Alfaro Siqueiros and Francisco Zúñiga). One 20-foot shelf is given over to Zuni art, which Jacobs got to know during his time on the Pueblo, an experience that he drew on for his forthcoming novel Zuni Stew. “My people literally planted and hunted their instruments,” Robert Mirabal told this magazine in February (“Rattle and Drum,” February 2014, mynm.us/rattledrum). It’s an ethos that the Taos Pueblo musician, who made his first flute at 19, has honored in spirit. When he started his career, the flute was a neglected instrument in Native recordings; now it’s a popular part of world music, and Mirabal is a Grammy winner. In the meantime, he’s added a host of other titles to his CV, including painter, author, and—yes—farmer. His next big thing may just be about to sprout. Around the world, George R. R. Martin is known as the author of the Song of Ice and Fire series—ruthless toward his characters, unhurried in his publication schedule. Around Santa Fe, he’s known as the guy who saved the Jean Cocteau Cinema (“Revival House,” June 2014, mynm.us/martincocteau). A mainstay of the capital’s film scene once more, the Cocteau screens classics, cult favorites, and Game of Thrones, the HBO series based on Martin’s novels, which seems to be well on its way to becoming both. Top image: Don Redman in his studio, with maquettes for a work in progress.